a new high-performing way for advertisers to grow their businesses across both search and the very best of display opportunities in a single campaign: Search Network with Display Select. Now we're excited to share the early results: Search Network with Display Select campaigns are helping advertisers gain up to 15% more customers than search campaigns alone. In fact, the average advertiser can see a 35% higher click-through-rate, and a 35% lower cost-per-customer purchase on the display portion of their Search Network with Display Select campaigns. WordStream, an agency specializing in pay-per-click advertising turned to Search Network with Display Select to broaden its clients’ reach and convert new audiences across the web. “As an agency we understand the long-term benefits of display, but when money is coming out of a client’s pocket, they want to see a direct return,” says Rich Griffin. Safeguard Tubs makes walk-in bathtubs for seniors. They saw a 25% increase in their overall conversions at a cost-per-acquisition on par with their previous campaign by reaching new customers on sites like AARP.com. Blindster, an online seller of blinds and shades, drove 22% more conversions by showing their ads on DIY sites and home design blogs. Another company that has found success using Search Network with Display Select is ELMO Talent Management Software, a SaaS HR systems company who found themselves maxing out traffic for super-competitive keywords like ‘LMS’ and ‘Performance Management System.' They turned to Search Network with Display Select, and in 3 months saw 20% of customer acquisitions coming from display ads, at a cost-per-lead 40% cheaper than their previous campaign. It's not just for online businesses, either. Porter's Patch, a Wisconsin family farm, saw a 20% increase in website visitors from display with 60% lower cost per click. The best way to find out how this campaign type performs for your account is to log in and try it out! We've made upgrading to Search Network with Display Select easy in the AdWords interface, with step-by-step instructions available in the AdWords Help Center here. We'll also be doing a Hangout with Rich Griffin and his WordStream team on on Wednesday March 31st, 10am PT / 1pm ET. Sign up here and then tune in on March 31st. Or, send us your questions and comments at #SNDS -- we'll be ready to answer. And to learn more about new Search Network with Display Select, visit our help center. Our customers are accessing information across multiple devices, and might look at 10 different sources - online reviews, news articles, recommendations from friends and more - before making a purchase. Display advertising captures these signals, enabling advertisers to connect with customers across millions of sites, videos and apps. 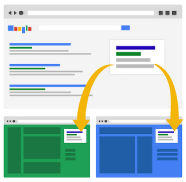 But for some advertisers, managing separate search and display campaigns can be complex and time consuming. Last fall we launched a new high-performing way for advertisers to grow their businesses across both search and the very best of display opportunities in a single campaign: Search Network with Display Select. 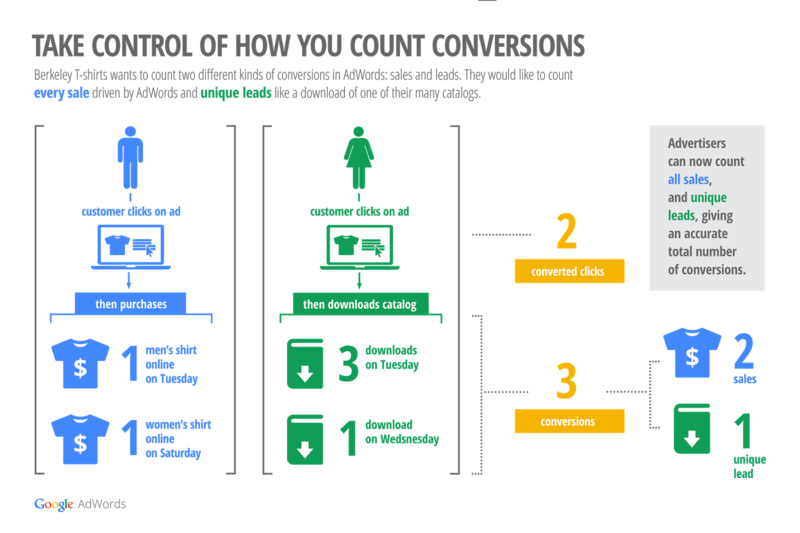 and cross-account conversion tracking, you’re able to more accurately measure conversions in AdWords and better understand the complex path to purchase. Today, we’re excited to launch flexible conversion counting. Flexible conversion counting is an improved way for you to count conversions that really matter to you. Now you can better measure the value of each click that turns into business results. Want to know more? Check out this video to see how flexible conversion counting makes it easier to count all of your conversions. Read more information about flexible conversion counting in this Help Center article. We’ve been working hard on building products and features that help you better understand the value you’re getting from AdWords. With estimated cross-device conversions and cross-account conversion tracking, you’re able to more accurately measure conversions in AdWords and better understand the complex path to purchase. *For a full list of countries targetable with Product Listing Ads, visit the help center. , to Kate Spade’s holiday ads. As we invest to improve brand measurement for the entire industry in all these areas, we are keeping a few things in mind. First, measurement should be actionable - real time insights to improve campaigns as they run, not after-the-fact reports that can only improve future ad buys. Second, we know our clients want measurement that is open and transparent so we’re partnering with the industry to create metrics that serve as a true currency between buyers and sellers, and offer flexibility and choice to marketers. Last year, comScore estimated that 54% of ads running on the web aren’t seen by the user. Maybe the reader scrolled past your ad; maybe she never got to it. We’re supporting industry initiatives, like the IAB’s Making Measurement Make Sense (3MS) to establish new standards. And late last year, we made it possible to buy based on viewability on the Google Display Network. This capability is based on our MRC-accredited Active View technology, a transparent and actionable viewability metric that we’re gradually rolling out to both marketers and publishers. It’s early days, but we’ve already seen more than 1,500 brands buying impressions based on viewability, across more than 100,000 sites on our network. In TV, marketers use the concept of a Gross Rating Point (GRP), by which they measure the reach and frequency of their campaigns among different demographics. For digital campaigns, there are a number of options for marketers wanting a digital GRP across screens. For example, last year, we started testing comScore vCE (validated Campaign Essentials) and Nielsen OCR (Online Campaign Ratings) for campaigns on YouTube and across our network. While we’re excited by the efforts in the industry to introduce GRPs to the digital market, we believe we haven’t yet reached the full potential of this metric. And so today, we’re excited to announce that we’re taking another step forward by partnering with comScore to turn vCE into a digitally actionable metric. By working closely with comScore and the industry, we believe we can make a GRP metric that will be completely actionable: both advertisers and publishers will be able to see if a campaign is reaching the right audience in real time and make adjustments if it isn’t. No more waiting days or weeks for reports, no more wasted media, no more missed opportunities. This objective, third-party vCE metric is being built directly into our DoubleClick ad serving products, where it can serve as a transparent currency for both marketers and publishers to buy, sell and measure ad space across sites, formats and screens. 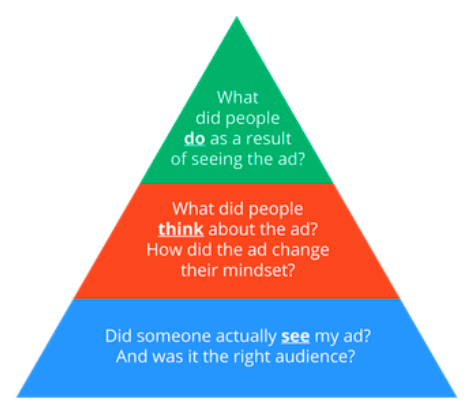 At the top of the pyramid, brands want to measure the impact of advertising on core brand metrics like awareness, favorability, purchase consideration and, ultimately, sales. We're developing a suite of Brand Lift products to help here. Last year, we began a small test of surveys to measure the impact of a brand's campaign. Measuring ad effectiveness by conducting surveys is not new. But generally they’re slow to provide results, and get very low response rates. In our early tests, we’re seeing 20-30% user response rates (significantly higher than traditional surveys), coming through in near real time. This enables brands to turn the results into immediate action: brands that are using Survey Lift have seen an 82% lift in ad recall, along with a 64% lift in brand awareness. For example MasterCard was able to double brand recall for one of their holiday campaigns based on insights gleaned from surveys. Based on this early promising feedback, we’ll be rolling these surveys out more broadly, for more types of campaigns, in coming months. There’s lots more to come, and we're working on ways to help brands at all stages of the measurement pyramid. More actionable, open and transparent measurement will help bring more great campaigns and brands online, which in turn helps to fund web services and content. We’re looking forward to working with the industry and partners to help make this a reality. The world’s major brands are now building their marketing campaigns for the digital world, from Dove's Real Beauty Sketches, to Toyota's Car Collaborator, to Kate Spade’s holiday ads. to ensure that you cover everything in your post-holiday analysis. Are you doing all you can to get ready for the next holiday season? It’s never too early to start preparing for this year’s critical holiday season. Building a plan from past performance and updating it as you find new opportunities sets you up for even greater success this year. Give the gift that keeps on giving to your account. Download the Post-Holiday Analysis Checklist today. Now that you’ve taken a breather from the last holiday season, it’s time to start preparing for the next one. For some of you, so much depends on the holidays that you’ll be spending most of this year preparing for them. We want to help you make the most of last season’s recap so that next season’s performance will be your best. That’s why we’ve put together this checklist to ensure that you cover everything in your post-holiday analysis.